The cross-cutting and mutually reinforcing social and environmental benefits of assuring equitable access to safe, clean, sustainable supplies of water have long been recognized as central to building and maintaining healthy societies and assuring environmental health and integrity. In a warming world experiencing ever-increasing greenhouse gas emissions and environmental degradation, water security has taken on even greater importance. Marking World Water Day 2013 and The International Year of Water Cooperation, UN delegates from around the world met for a High-Level Forum at The Hague this past week to recognize key outcomes and recommendations of the Thematic Consultation on Water in the Post-2015 Development Agenda, the culmination of an unprecedented “inclusive and bottom-up approach that is measurable, realistic and inter-generational that will promote an equitable and sustainable use of water for growth and development. As stated on the UN-Water World Water Day 2013 website, “the fulfilment of basic human needs, our environment, socio-economic development and poverty reduction are all heavily dependent on water.” Yet best estimates put the number of people who lack access to an improved water supply at some 780 million with many more lacking access to safe, sustainable supplies of drinking water. Worse still, it’s estimated that some 2.5 billion lack access to improved sanitation. “Good management of water is especially challenging due to some of its unique characteristics: it is unevenly distributed in time and space, the hydrological cycle is highly complex and perturbations have multiple effects,” UN-Water notes on the Water Cooperation section of its website. Last November the UN for the first time in its nearly 68-year history initiated a series of discussions regarding how to assure human development through water employing a rights-based approach discussed at the Rio+20 Conference in June, 2012. UN-Water, UNDESA and UNICEF co-led the discussions, with Jordan, Liberia, Mozambique, Netherlands and Switzerland acting as co-hosts. The Post-2015 Thematic Consultation on Water went through three stages, expanding outward through the use of face-to-face meetings, social media and interactive Web platforms. In the first, some 4,451 people in 185 UN Member States participated in the process. The second stage entailed organizing, assimilating and distilling all the responses and debates into a concise document. The final stage is one of synthesis that aims “to recommend a pragmatic and equitable development path forward, consisting of a vision with integrated goals and specific targets. “Water is a key determinant in all aspects of social, economic and environmental development and must therefore be a central focus of any post-2015 framework for poverty eradication and global sustainable development,” the report authors emphasize. The following synthesis focuses on “the more prominent, recurring recommendations to emerge from the consultation and could shape the Post-2015 Development Agenda.” Those looking for more comprehensive, detailed and granular insights and recommendations will find the full Post 2015 Water Thematic Consultation Synthesis Report available free for download on the UN-Water World Water Day 2013 website. Water, Sanitation and Hygiene, Water Resources Management and Wastewater Management and Water Quality are all indispensable elements for building a water-secure world. 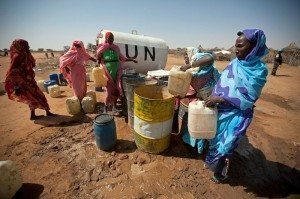 If water issues are not addressed adequately in the Post-2015 Development Agenda this would not only mean a water crisis, but several other crises in water-dependent sectors. Water security will be of growing importance on the political agenda. Governments play a key role in securing water for competing demands; however the quest for a water-secure world is a joint responsibility and can only be achieved through water cooperation at local, national, regional and global level and through partnerships with a multitude of stakeholders ranging from the citizens to policy makers to the private sector. Building water-related capacity development, both at the individual and institutional levels, will be fundamental in the realization and implementation of the Post-2015 Development Agenda. Fresh water is an absolute prerequisite to attain vital economic, employment, health, educational, agriculture/food, energy benefits; to maintain ecosystems services; and to support resilience to climate change. Thus water must feature prominently in the new development framework. It must be a standalone goal with clear targets and measurable indicators, so that its fundamental role in support of life, economic development and well-being can be addressed properly in the Post-2015 Development Agenda.